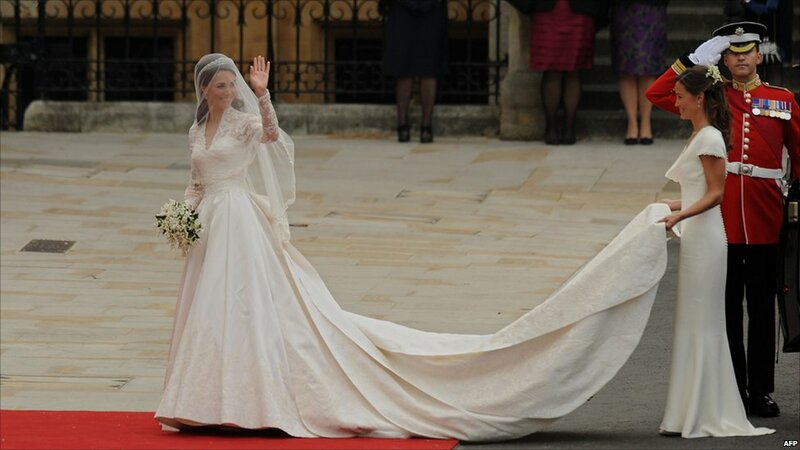 The Royal Wedding Dress was designed by Sarah Burton, the lead designer for Alexander McQueen. The once-in-a-life-time opportunity was given to Burton in March, who took over as creative director of Alexander McQueen following his death last year. Ms Burton said creating the royal wedding dress had been the “experience of a lifetime”. The dress had a lace appliqué bodice and skirt, and a veil that was held in place with a Cartier “halo” tiara, lent to Miss Middleton by the Queen. The bride wore her hair in a demi-chignon, styled by new up and coming talent James Pryce from the Richard Ward salon. Kate did however do her own make-up. All the fabrics used in producing the dress were sourced from and supplied by British companies, including the bridal train, which measures 2m 70cm. 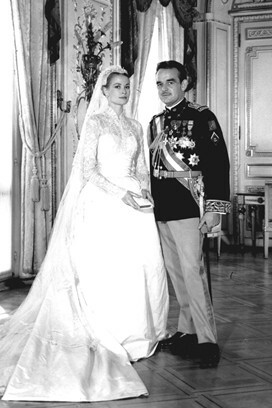 The lace on the bride’s dress which very closely resembles the style of Grace Kelly’s wedding dress, details a rose, thistle, daffodil and shamrock to represent each nation of the UK.